Access emergency funds anytime, anywhere with Personal Loan 2.0 by MoneyTap. A personal line of credit with no hassles and delays of a traditional loan. Only pay interest on the amount you actually use! 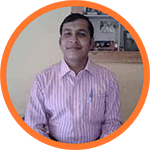 Why is MoneyTap Personal Loan 2.0 Better? 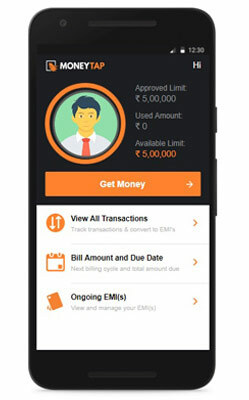 Calculate your Personal Loan EMI now? With our personal loan EMI calculator, you can try out various combinations of loan amount, interest rate and loan tenure to decide on the combination that works best for you. The calculator gives a clear breakup of how much of each EMI goes towards the principal and how much of it pays the interest. Once you receive the final approval, your credit line is ready to use - anytime, anywhere.
" It feels great to have an app like MoneyTap to make any money transactions and also view it whenever required. The app is quite user-friendly and easy to use. I would suggest anyone requiring a credit card to go with MoneyTap. " " This is an amazing app. The application process on the app is very simple. Within minutes, I got to know my eligibility. The option of paying back in EMIs is very good. I liked the passcode verification on the app very much, it adds lots of security. " Higher Personal Loan Interest Rates Than Others? A personal loan is money borrowed from a lender that you need to repay in monthly instalments that typically range from 2 to 5 years. Secured personal loans: A secured personal loan requires you to pledge your car, valuable assets or your house to guarantee repayment. While a secured loan has lower interest rates, there is also a risk of losing your valuable assets if you fail to repay the debt. Unsecured personal loans: Unsecured personal loans require no collateral and can be used for any reason, including wedding expenses, travel costs, medical emergencies, home renovation, or debt consolidation depending on your current financial needs. To know more about a personal loan and types of personal loans, read this. Yes, a personal loan makes perfect sense for several circumstances because it is a feasible option that gives you easy access to cash. Unlike specific loans that are granted for a particular reason, a personal loan can be used in any way you like. What factors should you consider before applying for a personal loan? Evaluate your financial needs and your capability of repaying that amount before deciding on a loan. Determine the eligibility criteria of different banks to figure out which criteria you fit in. Check the list of documents that you will need and arrange for those documents before applying for a personal loan. Verify the time it will take to process your loan so you can avail of the fund in the timeframe best suitable for you. Be aware of the interest rates, fees & processing charges as they can make or break your loan experience. Compare APRs of various lenders to check which lender offers the lowest. Low APR will help bring the overall cost down. Figure out if you will be able to make EMI payments before applying for and committing to a loan. Be aware of foreclosure charges that different banks charge as this is often missed by a lot of people. Your CIBIL score will define your creditworthiness. Make sure you have a score that banks will accept. Will I get a personal loan if I don’t have a bank account? No, you cannot get a personal loan from any bank or NBFC if you do not have a bank account. A secured loan is protected by collateral in the form of a house or a car or an asset of some sort. A secured loan requires you to guarantee security that you will pay back the loan on time or lose your assets if you default. As the name implies, unsecured loans are the exact opposite of secured loans and do not need a collateral. They include education loans, signature loans as well as credit card purchases. What is the difference between reducing and flat interest rates? A flat interest rate is the interest rate calculated on the full loan amount throughout the loan tenure without considering the monthly EMIs that reduce the loan amount with every repayment. Here’s an example to help you understand how the flat interest rate works for a principal loan amount of ₹ 100,000 with a yearly interest rate of 10%. In reducing interest rates, the interest is calculated on the outstanding amount that keeps reducing with every monthly repayment. This means that the EMI is calculated every month taking into consideration both the interest on the outstanding loan amount and the principal. Now let’s look at the same example, but this time with a reducing interest rate. Am I eligible for MoneyTap's Personal Loan 2.0? Salaried employees or self-employed professionals like doctors, lawyers, shop owners, business owners, etc. with a minimum monthly salary of ₹ 20,000 in hand. Self-employed professionals who are eligible to apply for MoneyTap’s credit line include Doctors, Lawyers, Architects, Government Employees and CAs. Above 23 years of age and below 55 years. Residents of Ahmedabad, Anand, Bangalore, Chennai, Chandigarh, Coimbatore, Delhi, Gandhinagar, Hyderabad, Indore, Jaipur, Mumbai, Mohali, NCR, Panchkula, Pune, Rajkot, Secunderabad, Surat, Vadodara, Vijayawada, and Vizag. We will be expanding to other cities shortly. What is the interest rate that will be charged on my MoneyTap Personal Loan 2.0? The interest rates for MoneyTap loans typically range from 13% to 18% annually. The exact interest rate depends on your credit score which is based on your repayment record, defaults and bounced cheques. With MoneyTap Personal Loan 2.0, you have the advantage of paying interest only on the amount you use and not on your entire approved limit. The applicable interest rates are shown to you upfront with your EMI and you are charged only after you approve it. Will taking MoneyTap's Personal Loan affect my credit score? A good CIBIL score is a prerequisite for you to get credit. So, when you get approved for a MoneyTap credit line, use the cash and repay on time, and you start building your credit history. Taking credit and repaying on time is the best way to improve your credit score. To make sure you don’t miss out on your repayments, we send you reminders every month. Will my EMI be auto-debited from my bank account? Yes, you can visit the website of our partner bank that has approved your loan application and follow their instructions to set up the auto-debit system for your repayments. Foreclosure vs part-payment, what is the difference between the two? If you are able to repay the entire outstanding amount of your loan before your predetermined loan tenure ends, it will definitely help you save big on the interest because it automatically reduces. However, if you don’t wish to prepay your entire loan amount in one shot and want to prepay a part of the outstanding loan amount early, you can do so by paying part of the total loan value at a time convenient to you. Please note that not all banks or lending platforms offer part prepayment. Do I have to provide any security, collateral or a guarantor’s details to gain approval on my MoneyTap Personal Loan 2.0? No, with MoneyTap’s app-based credit line you get instant access to cash anytime, anywhere without needing any security, collateral or guarantor. No. Being an unsecured loan by nature, MoneyTap Personal Loan 2.0 from your available credit line does not need any guarantors! Do I need a collateral to take a personal loan? With MoneyTap, you can get approved for a personal line of credit of up to ₹ 5 Lakh for any need you may have for a personal loan without needing any collateral or security. What is MoneyTap’s Personal Loan 2.0? MoneyTap Personal Loan 2.0 is a flexible credit line with some great features like no usage-no interest, lifetime credit availability, flexible borrowing options, no collateral and no guarantors! It is a ready source of funds that can be accessed anytime for personal and professional needs. You can withdraw as little as ₹ 3,000 or the entire approved limit in one shot in case of an emergency. Since MoneyTap Personal Loan 2.0 is a revolving credit line, you can withdraw money, repay based on your cash flow and spend it as and when you like because your credit cycle is virtually never-ending! The money upon repayment will be available again so you don’t need to reapply as long as you make the monthly payments on time. What are the different types of personal loans that MoneyTap offers? MoneyTap’s personal line of credit can be used for just about anything – from a home remodel and a family wedding to online shopping and medical emergencies. You can also use the credit line to cover your education expenses, when travelling abroad, to buy a laptop, to pay for unexpected business expenses or for debt consolidation. How does MoneyTap's Personal Loan 2.0 work? What are the key documents required when applying for Moneytap’s Personal Loan 2.0? Are there any extra charges applicable when applying for a Personal Loan? The annual interest rate starts at 13% but it is applicable only on the amount you use and not on the entire limit that is available to you for any time use. The exact interest rate will depend on your credit score and will be mentioned upfront with your monthly EMI which needs to be approved from your end. You are charged only after you approve of the EMI. Every time you withdraw money from the app, you are charged a nominal processing fee (plus applicable GST) only on the amount that you use. The fee amount gets added to your next month’s statement. 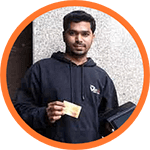 MoneyTap Credit Card 2.0 can be used just like your regular credit card, and all the charges are totally interest-free provided you repay by the due date every month. You also have the flexibility of converting every swipe of ₹ 3,000 or more into an affordable EMI which you can choose to repay in your billing cycle. If you don’t wish to pay it back, the interest and the services charges are shown upfront at the time of conversion. If you choose to pay back any of your withdrawal amounts before your billing cycle, you are not charged any prepayment penalty. A penalty is applicable on late repayments. Are Personal Loans from MoneyTap hard to get? No. All you need is a few minutes to follow our 100% hassle-free online process. Simply download the MoneyTap app, register online, follow the preapproval process by submitting your basic details, complete the KYC online and get the money on approval! You can also track all your transactions with a single tap. What is the minimum and maximum amount that I can borrow from MoneyTap? The minimum amount that can be borrowed from MoneyTap’s line of credit is ₹ 3,000 and the maximum you can borrow is up to your approved credit limit which can be up to ₹ 5 Lakh. What are the different repayment tenure options available for MoneyTap's Personal Loan 2.0? MoneyTap’s personal loans can be repaid in equal monthly instalments of your choice over a convenient tenure which can be anywhere between 2 months to 36 months. How can I repay my MoneyTap Personal Loan 2.0? You can repay through cheque, online through the MoneyTap app or directly to the bank where it is automatically deducted with eNACH. How long does it take to get approved for a Personal Loan 2.0 from MoneyTap? The processing happens instantly once you submit your basic details and the pre-approval takes nothing more than a few minutes. However, the final approval may take a few more days after you complete the eKYC. How much time does it take to process my Personal Loan 2.0 from MoneyTap? On an average, people typically take around 4-5 minutes to get a pre-approval after they have installed the app. The speed might vary depending on your typing speed. However, the final loan disbursal may take a few more days after you complete the KYC. How do I keep track of my transactions done regarding MoneyTap's Personal Loan 2.0? For example bank statements or transactions? Everything from your withdrawals to your repayments can be tracked in real-time on the app. Is it necessary to download the MoneyTap app to get a Personal Loan? Yes, you need to download the app because the entire process is completely online to eliminate the hassles of paperwork and ensure faster approvals. You’ll also need the app to transfer money from MoneyTap to your bank account. However, you can get pre-approved for the loan on the MoneyTap website here. Will banks check my CIBIL Score before processing a Personal Loan? Yes, the bank will check your CIBIL score to assess your creditworthiness. The higher you score, the better are your chances of approval. What is the best way to contact MoneyTap? Please get in touch with us at hello@moneytap.com for all your queries and concerns. Also, do notify us in case you change your phone number as it is a critical security requirement because all your funds are tied to your number and your KYC details. You can get approved for a credit line starting at ₹ 35,000 up to ₹ 5 Lakh from which you can take a personal loan of ₹ 3,000 up to your entire approved amount. Is my data safe with MoneyTap? For what durations are MoneyTap Personal Loans granted? You can choose from convenient EMIs of 2-36 months to repay your MoneyTap Personal Loan 2.0. Being a revolving credit line, MoneyTap loans can have a lifetime credit limit. This is because every time you repay the borrowed amount, your credit limit gets recharged by the same amount. So, as long as you are regular with your repayments, you have the freedom to withdraw as many times as you want. Can I apply for a Personal Loan without my PAN and Aadhaar Card? No, this is basic documentation requirement if you wish to apply for MoneyTap’s personal line of credit to borrow personal loans from. What is MoneyTap’s processing fee? Note: You are charged a processing fee on the amount transferred and not on the approved limit. This fee is added to your next statement. Can I get a Personal Loan for business purposes? Yes, you can use MoneyTap’s personal line of credit to fund a small business or for managing cash flow. What if I miss/do not pay on my scheduled Personal Loan EMIs? Our partner bank will report this to all the credit bureaus including Experian, Highmark, CIBIL, and Equifax. This will have a negative impact on your credit report so if you apply for a loan or credit card in the future, it will affect your approval limit and your interest rates. You will invite a late payment fee of 15% which can range anywhere between ₹ 350 to ₹ 1000. If you fail to repay the loan even after repeated reminders, the bank may initiate their recovery procedures. So, make sure you don’t miss out on your payments.